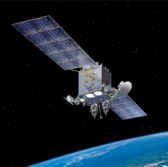 Telesat has received a contract from the Defense Advanced Research Projects Agency to assess the capability of commercial satellite constellations in low-Earth orbit to support the Pentagon’s future broadband connectivity requirements and other space-based communication needs. The company said Tuesday it will collaborate with Leidos on the contract awarded through DARPA’s Blackjack program. Blackjack seeks to leverage ground infrastructure, spacecraft buses and other commercial space tech platforms to deliver low-latency communications, global persistence and tech refresh capabilities. “DARPA is exploring a ‘pivot to LEO’ for future DoD space missions and we expect that Blackjack will confirm the economy, resiliency and power of these new space architectures,” said Don Brown, general manager of government services at Telesat. Telesat announced in August that it selected an Airbus-led team and a consortium of Maxar Technologies and Thales Alenia Space to come up with system designs for its LEO satellite constellation.